Girls’ golf is beginning another enjoyable season under the coaching of Mark Smith. The weather is warming up, the grass is getting greener, and the days are getting longer. Spring has finally arrived, which means it’s girls’ golf season. With the change in seasons comes a joyous time for all of the female golfers at Thomas Jefferson, whether they are there to improve their game, spend time with friends, or just to give Mark Smith a hard time. The TJ golf season may be laid-back, but the girls are always ready for competition. Golf coach and former TJ history teacher, Smith,, is sure to keep the environment fun and positive. Although the weather has caused this season to start off slow, he believes that “…things will work out and hopefully everyone will learn and enjoy the game.” So far, this has proven to be true, and even with the snow, the girls have been working hard to better their golf game. Smith even noticed that this team has a certain enthusiasm for the sport that he has not seen in recent years. The girls all have varying skills, but each individual works hard to advance their play. Whether they play the par 3, a shorter course, or regulation, a longer and more challenging course, every girl is able to work on boosting their performance at each tournament and practice. “I always look forward to improving my skill. 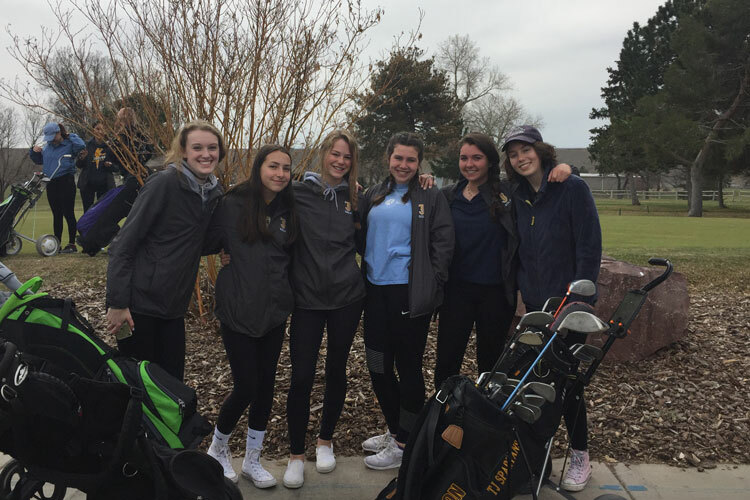 Every practice is an opportunity for success and self actualization,” explained senior Eden Turnbow, who has played golf every year she has attended Thomas Jefferson. Despite competing at different levels, the girls work together to help each other grow not only as golfers, but as people. While two tournaments have passed, much of the season is still ahead and the girls are enthusiastic about their golf futures. Junior Mary Jarecke enjoys spending the time with her teammates turned sisters. “Socializing with pals” is her favorite part of the game.